Siddhartha renounced his kingdom in search of 'truth'. But 'truth' was not easy to be found. He took to the life of an ascetic, like the one he saw as the last of the Four Passing Sights. The ascetic, with a peaceful face, inspired him most. During his search, he traveled to distant lands. And for six years he lived as a solitary forest-dweller, at first as the disciple of two renowned Hindu masters. Then, after deciding he had learned all that they could teach him - which he felt was not enough - he joined a band of ascetics and with them he practiced such extreme austerities and ate so little that he was about to die. Study with the Hindus had not brought him the enlightenment he was seeking, nor had his experiment with asceticism. Rejecting self-indulgence as well as self-mortification, he determined to follow what he called the Middle Path and to devote himself to a course of mental cultivation and mystical concentration. was to bring mankind a new religion. When he arose he was enlightened, he was the Buddha, ready to go forth and teach others how to become enlightened. The tree under which he meditated came to be known as the 'Bodhi Tree', the tree of wisdom. And the place where this happened is still known as Bodh Gaya, now in north eastern part of India. It is believed that he attained nirvana on the day of the full moon in the month of Vaishakha, or Vesakha. It became a great Holy Day for the Buddhists. It was also on this day Buddha gave his first sermon at Sarnath, also in the North Eastern India. This is why the Buddhists rotate the prayer wheels in the belief the prayers written on the wheels get dispersed on this day. The day when Prince Siddhartha became Gautam Buddha and again the day when he gave his first sermon at Sarnath. Soon after his enlightenment the Buddha preached to a small group of the curious and those who heard his words became his disciples. From then on the Buddha devoted the rest of his life to teaching those who sought his advice, his compassion, his wisdom. The growth in the number of his disciples led to his establishment of the Sangha, the Buddhist monastic order. It was his disciples who passed along his teachings, by word of mouth, from generation to generation. Not until some considerable time after his death, were the words of the Buddha recorded in written form. 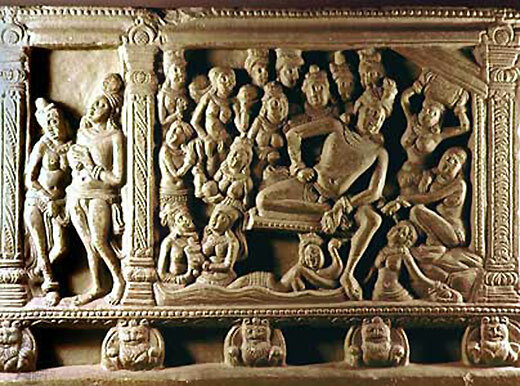 Finally Buddha liberated himself from the cycle of rebirth and achieved mahaparinirvana, also on the auspices of Vesak.